This badge was issued to DUANE ARITONANG on 30 Nov 2016. The badge earner is a technical professional who has demonstrated an advanced level of capability through their skill and knowledge of the infrastructure, implementation and functional aspects of working within a Maximo Asset Management v7.6 project. Earn the IBM Certified Deployment Professional - Maximo Asset Management v7.6 Functional Analyst certification. 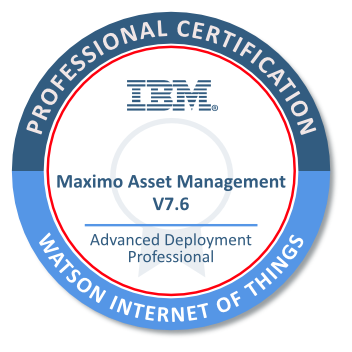 Earn the IBM Certified Infrastructure Deployment Professional - Maximo Asset Management V7.6 certification.